Could Boeing Co. Hike Its Dividend by 30% or More? Boeing has the financial firepower to implement a huge dividend increase, but it might not be a good idea. It's getting close to mid-December, which means that Boeing (NYSE:BA) shareholders could soon be getting some good news about the aerospace giant's capital return plans. Since 2013, Boeing has more than doubled its dividend payout through a series of big dividend increases each December. 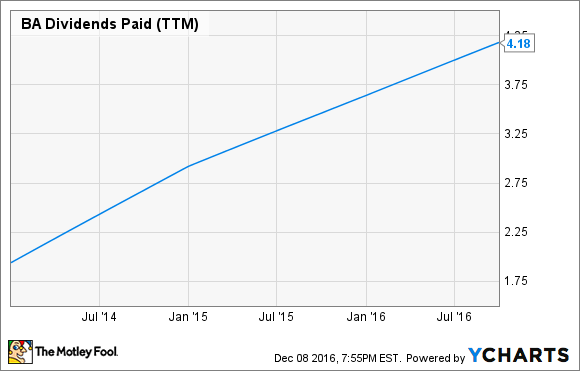 Boeing dividends paid (TTM), data by YCharts. Last year, Boeing increased its quarterly dividend by about 20%, from $0.91 to $1.09, boosting its annual yield to a little more than 3%. Some analysts think that Boeing could be even more aggressive this year, raising its dividend by 30% or more. Let's see whether Boeing is likely to delight income investors with a big dividend increase like this. Boeing has increased its dividend and share repurchases every year for the past several years. Rising aircraft production and improving profitability for the 787 Dreamliner have driven steady cash flow growth for the company, enabling Boeing to return lots of cash to shareholders. In the next few years, Boeing expects cash flow to continue rising. A combination of supplier price reductions, internal cost cuts, improving product mix, and firmer pricing (on average) will dramatically improve the profitability of Dreamliner production. Meanwhile, Boeing is set to raise output for the workhorse 737 jet from 42 per month to 57 over the next three years. Rising 737 production will be a key driver of cash flow growth at Boeing. Image source: Boeing. Despite these catalysts, some investors are worried about the risk that Boeing will have to dramatically slash production of the 777 jet over the next year or two. By 2018, deliveries of this cash cow model could potentially fall by more than half relative to today's level. However, Boeing CEO Dennis Muilenberg has assured investors that even in this downside scenario, Boeing's cash flow would grow steadily for the next several years. Boeing expects free cash flow to total $7.2 billion this year, with operating cash flow of about $10 billion offset by $2.8 billion of capital expenditures. That provides ample cushion for Boeing's annual dividend payments of roughly $2.7 billion. This is a big reason why analysts at Morgan Stanley recently predicted that Boeing will raise its dividend by 30% -- and possibly as much as 50%. The analysts also believe that a big dividend increase would send a strong signal to investors, increasing their confidence in Boeing's rising cash flow narrative. As a result, they think such a move could send Boeing shares soaring as high as $200. Three years ago, Boeing boosted its dividend by 50%, so Boeing wouldn't be entering uncharted territory with an increase of that magnitude. That said, the situation is not quite the same, as it is starting with a much higher dividend now. Even with a 50% dividend increase, Boeing would only be spending about half of its free cash flow on dividend payments. However, it probably wants to continue growing its dividend at a double-digit rate for as long as possible. And while Boeing has a nice opportunity for steady free cash flow growth over the next five years, aircraft manufacturing remains a cyclical industry. Given the likelihood that Boeing's free cash flow growth will eventually reverse, it would be wise for the company to maintain a conservative dividend payout ratio. Furthermore, there's no guarantee that a big dividend increase would cause the stock to jump. If interest rates start to rise in the next year (as many investors expect), high-yielding stocks will start to look less attractive by comparison. Raising the dividend by 15%-20% would probably make more sense. It would still push Boeing's dividend yield well beyond 3%, based on the current stock price, while leaving plenty of room for future increases. Meanwhile, Boeing could use the extra cash to continue its program of aggressive share repurchases, driving faster EPS growth in the coming years.